Phil Mickelson's bid for a fourth Green Jacket is in doubt after he pulled out of the Texas Open with a muscle strain less than two weeks before the Masters. The three-time Augusta winner withdrew after 11 holes of his third round after pulling a muscle in his side. "I pulled a muscle on my downswing on the first. It just killed and wouldn't subside for 10 or 12 seconds," he said. Tiger Woods is receiving treatment for back spasms and has said he is not sure whether he will be fit for Augusta. 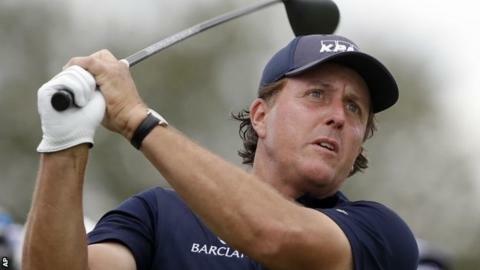 Five-time major winner Mickelson, 43, who won the Open at Muirfield last summer, has had a slow start to the season. A back problem forced him out of Torrey Pines in February, and he has not had a top-10 finish in eight starts. He entered the Texas Open for the first time since 1992 in a bid to play more competitive rounds before the Masters and had also planned to play in next week's Houston Open, which he won in 2011. World number one and four-time Masters champion Woods withdrew from this month's Arnold Palmer Invitational at Bay Hill because of a back problem. Woods won the last of his 14 majors in 2008 and is still four titles short of Jack Nicklaus' major record. The Masters, the year's first major, starts on 10 April.